I'm excited to say that my friends are slowly beginning to pin! What do you think of after reading that first sentence? Do you think of pinning items to a bulletin board? Maybe, maybe not, but if you did you are on the right track! 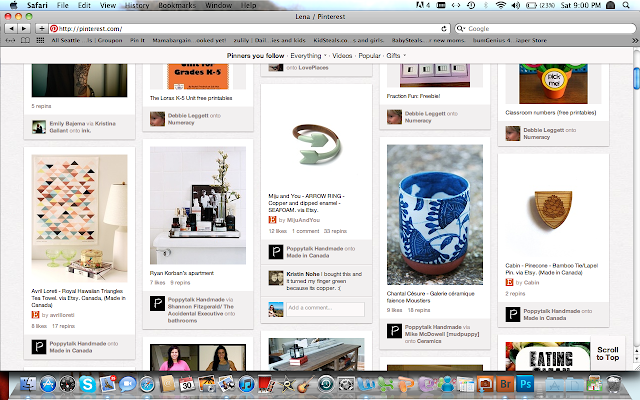 Pinterest is the new way to organize and display items online that you come across while traveling through the web. Forget bookmarking and making folders, you'll roll your eyes at yourself for spending all that time when you experience the ease of Pinterest! My favorite part of Pinterest is that I also get to see what my friends deem pin worthy by following them. Pinterest takes some basic ideas of Facebook and Twitter by having a central page (familiar to a feed) which continually updates with what the people you are following pin. Your pins are organized into boards such as: crafts, fashion, baking, kitchen inspiration, etc, and those boards are all public. A fabulous feature of the boards is that you can choose to either keep your board open to only your own pinning or add friends to pin on your board as well. Sharing of boards is something I'm actually doing with my friend Layken. Layken is getting married next summer so she's collecting ideas right now. A few nights ago I invited Layken to Pinterest (touch on this soon) and then she created several boards all focused on the wedding. Once the boards were created she added several friends to those boards so that if we stumble across a cute centerpiece or gorgeous bouquets, we can pin them to her boards for her to check out! So, to join Pinterest you have to request an invite. When I requested an invite from Pinterest it took about a week to receive my invitation. However, if you get personally invited by someone who is already a member you can join as soon as that person sends the e-mail. 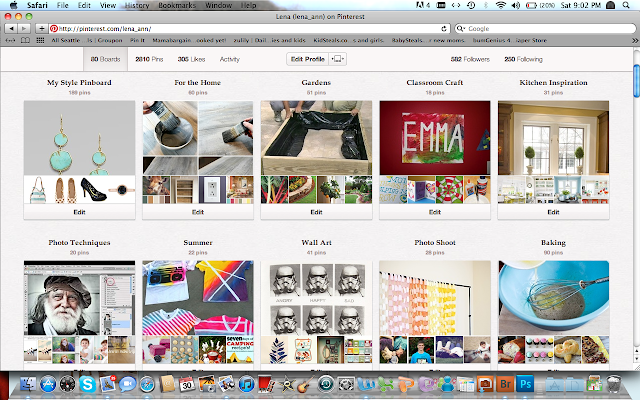 I can currently invite six people to join me on Pinterest and I'd love if you all did! The first six people to follow my blog and either leave a comment with their e-mail address or e-mail me (go to the contacts page) their e-mail address will be sent a Pinterest invite by me! Trust me, it will change you life! Check it out for yourself at www.pinterest.com.